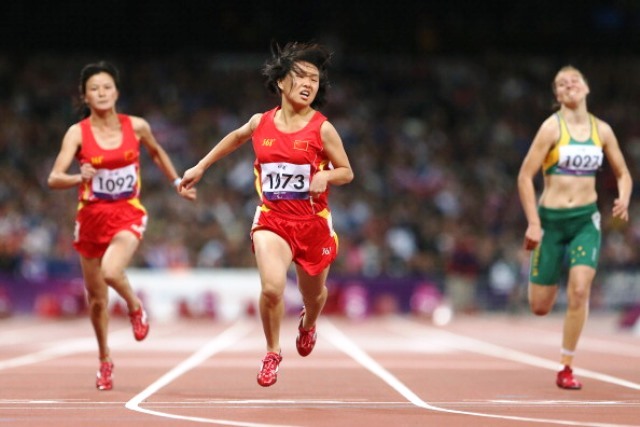 After winning the women's T35/37/38 200 metres crown yesterday, the Paralympic gold medallist Chen provided further evidence of her prowess by shaving almost six seconds off her own world mark in the T38 400m, clocking 1min 02.53sec. She followed that up with victory in the T35/37/38 100m, finishing ahead of compatriot Yingli Li. China won further gold medals on the track through Cuiqing Liu and guide Donglin Xu in the women's T11 100m, Qichao Sun in the men's T12 200m, Yang Liu in the men's T54 400m and Hongzhuan Zhou in the women's T54 1,500m. 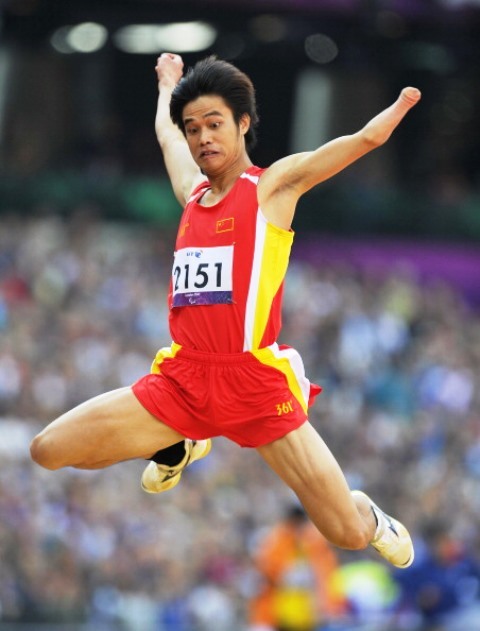 In the field events, Chinese dominance continued in with more gold medals that included F52/53/54 women's discus gold for Liwan Wang, Yanzhang Wang in men's F34 discus, Liangmin Zhang in women's F11/12 shot put, F46 men's javelin gold for Chunliang Guo and Fuliang Liu in the men's T47 long jump. On a successful day for India, Amit Kumar broke his own club throw F51 Asian record for gold in the F31/32/51 event with an effort of 21.31 metres, while teammate Sharad Kumar equalled a 12-year-old Asian record to win the men's T42/44/47 high jump with 1.80m. In the men's T34 100m Kuwaiti Ahmad Almutairi claimed silver behind Mohamed Alhammadi of the United Arab Emirates, setting a T33 world record of 16.81 in doing so. Min-Jae Jeon secured top honours for South Korea in the women's T36 100m to add to her gold in 200m from yesterday. Away from the track, the hosts swept the board in wheelchair dance sport. Jaewoo Lee and Hye-Jong Yang topped the podium in the combi standard class one, while a near perfect performance from Joon-Young Park and Moon-Young Choi saw them take the class two crown. Moon-Young teamed up with Jong-Chul Choi to also win the gold medal in the latin class two with their samba, rumba, pasa doble and jive all receivng the highest marks possible, except for one judge. 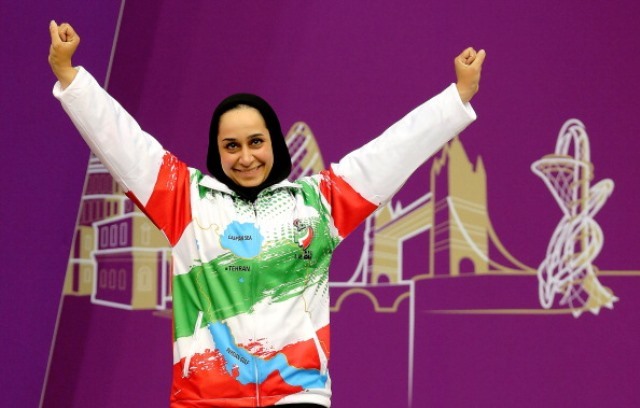 Iranian Sareh Javanmardidodmani is proving herself to be the outstanding shooter so far in Incheon after firing her way to a second gold medal and world record. After securing gold in yesterday's SH1 P4 mixed 50 metre pistol event with a world record mark of 192.8, Javanmardidodmani took the P2 title with a similarly impressive display. This time a world record score of 200.4 saw her top the podium ahead of Thailand's Sompron Muangsiri and compatriot Alieh Mahmoudikordkheili. There was a big shock earlier at the Ongnyeon International Shooting Range as China's Yaping Yan overcame compatriot and Paralympic champion Cuiping Zhang in the women's R2 10m air rifle standing. But Zhang returned later to take gold in the R8 women's 50m rifle three positions while compatriot and fellow Paralympic champion Chao Dong fired his way to top spot in the men's R1 10m air rifle standing. There was yet more Chinese success this time in the pool. Jiexin Wang claimed her second and third gold medals of the Games with wins in the women's S9 100m freestyle and 100m butterfly, to add to her 50m freestyle win yesterday, while Furong Lin also made it three wins from three in the men's S10 50m and 100m freestyle, and 100m butterfly. There were also double wins for Maodang Song, Guizhi Li and Shiyun Pan. Japan also had a successful day in the pool, led by reigning Paralympic champion and world record holder Yasuhiro Tanaka who dominated the SB14 100m breaststroke while Remi Watanabe took the women's title. London 2012 silver medallist Tomotaro Nakamura finished first in the men's SB7 100m breaststroke, while Jumpei Kimura won the men's SB6 100m breaststroke SB6 and Airi Ike took gold in the women's S10 50m freestyle. Meanwhile Kirill Pankov and Dmitriy Horlin are flying the flag for Uzbekistan with both men picking up their third gold medals of the Games. Yesterday, Pankov won the men's S13 50m freestyle before adding 100m freestyle and 100m backstroke today. Horlin opened his account with wins in the men's S12 50m and 400m freestyle and today added 100m gold to his collection.